Sotto13 greets you with a boisterous, cheerful atmosphere, and it is one of our favorite brunch spots to open this year, maybe even the best (yes, we know that's a big statement). 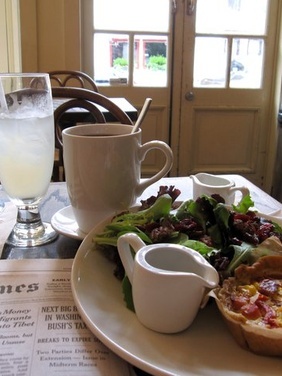 The place exudes an exciting energy that's perfect for a group brunch. We love the high ceilings, giant skylight, and "Social Italian" vibes. The f-ing Mushroom Pizza. We're not kidding. We know the ingredients, but we have no idea what their secret is to making it so delicious, and we're obsessed. Get one for the table when you are done sharing the French Toast Sticks and other tapas style dishes. Sotto13 has a $25 Unlimited All-You-Can-Drink boozy brunch with hefty pours of sangria, mimosas, and bellinis. 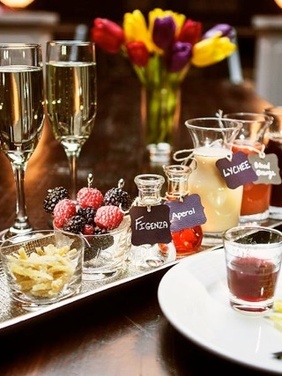 OR, go for the DIY-Prosecco Tray, that gives you an opportunity to be your own mixologist with prosecco, and a tray of five high-quality mixers including Aperol, fig-infused vodka (amazing btw! ), fresh juices, and toss-ins like candied ginger and fresh berries, for an extra $15 per DIY tray. Yep, they take them, even for parties as few as two people. 10:30am - 3pm Sat. & Sun. Sometimes you want to just do your own thing. Best known as a spot to grab a cocktail and a cupcake at night, Sweet Revenge is a calming place to avoid the masses by day. You'll feel chic sitting in this quaint cafe with its white tile juxtaposed against dark wood, and you have your choice of sitting next to the windows that fold open towards the street, at the bar, or at a traditional table. Feel free to spread out that Sunday Times. Go for something sweet like the Signature Belgian Waffles (your choice of Red Velvet or Mexican Vanilla) served with Whipped Cream Cheese, Salted Caramel Syrup, and Raspberry Sauce and Fruit. The quiche du jour is also a choice we like. Whatever you decide, don't leave without grabbing a signature cupcake-- they blow Magnolia's out of the water. Beer cocktails! Sweet Revenge has NINE to choose from-- from a Shandy to a Michelada "Mexican Bloody Mary." It's okay to get a little boozy by yourself. Their nighttime M.O. is pairing cupcakes with beer.